Likely the most famous of Avro Canada's aircraft, the CF-105 Arrow had the shortest life of the four aircraft designed by Avro Canada. In the autumn of 1952 the RCAF decided that, in view of the apparent increase in the threat, some consideration should be given to the ultimate replacement of the CF-100 (even before the CF-100 had entered squadron service). An evaluation team of senior RCAF officers went to all western alliance countries to ascertain the availablity of a suitable aircraft to fill the need, none of the foreign designes even being developed met Canada's needs. The Air Staff issued a specification, Air 7-3, for the project in May 1953. This was followed in July 1953, by a ministerial directive from the Department of Defence Production to Avro authorizing the company to carry out a design study for an aircraft to meet this requirement. 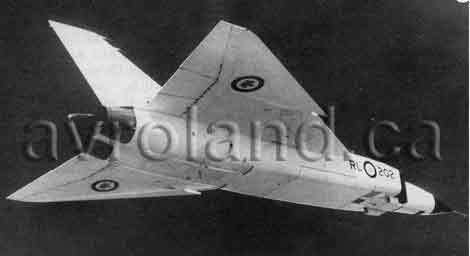 Two years earlier Avro's Chief Technician, Jim Chamberlin and Edgar Atkin, Chief Engineer had been investigating a number of congigurations for a CF-100 replacement and the RCAF had show some interest in a delta-wing design. Atkin had since left to join an American firrm and Jim Floyd was appointed Chief Engineer Between these two men came the proposal for the CF-105. Not unlike the early problems with the Canuck, the Rolls-Royce RB.106 which had been planned for the CF-105 came into question due to problems at Rolls-Royce, Avro quickly switched to the Curtiss-Wright J67, only to have the US government pull out support on that engine. The only suitable engine left was the Pratt and Whitney J75 which meant that the fuselage had to be completely redisigned. In view of the frequency with which foreign engines had been cancelled, a decision was made to fit the sixth and subsequent aircraft, to be designated Mark II, with a new technology engine being developed by Orenda. Due to the urgency of the program, Avro completed skipped the step of building a "prototype" aircraft and went right into building production aircraft! The first CF-105 (25201) was rolled out on 4 October 1957 and was christened the Avro Arrow. It first flew on March 25, 1958, with Jan Zurakowski at the controls. Although many have stated that the reason for the cancellation of the CF-105 was its costs, when you look at the real cost of the aircraft it was much less than what was spent on the fire contol system and missiles which were both insisted by the Air Staff and were billed against the CF-105 project, Avro had no control on this or the costs associated. In 1957 Canada elected a new Conservative Prime Minister, John Diefenbaker, a man who could not make a desision on his own from all accounts. On 24 September 1958 Diefenbaker placed an order for the U.S. Boeing BOMARC IM-99 anti-aircraft missile and announced that on 31 March 1959 that the Arrow program would be reviewed. On 20 February 1959 Diefenbaker anounced to Parliament that he had cancelled the whole Arrow program. Before noon that day Fred Smye was called by Department of Defence Production and informed that the Arrow and Iroquois engine contracts were cancelled and the companies must cease all work on the projects. At 4 pm, 20 February 1959, it was announced that the entire workforce was to be layed off until something was sorted out. This day is known as "Black Friday". The following Monday around 17% of the work force was called back to work to work on other projects still on the go including the Orenda engines for the CF-100 & the Avrocar project; when you think that Avro had a staff of 15,000 and there were over 650 Canadian companies supplying goods for Avro projects the impact to the nation could be seen as nothing less than criminal! There are a few CBC clips in French.